The surrender begins at 9am on Monday, January 21 and ends at 5pm on Friday, February 1. Members of the public can take firearms or ammunition to any police station where they can dispose of them. This includes replica and antique firearms, air weapons, BB guns, imitation firearms, component parts and other ballistic items. 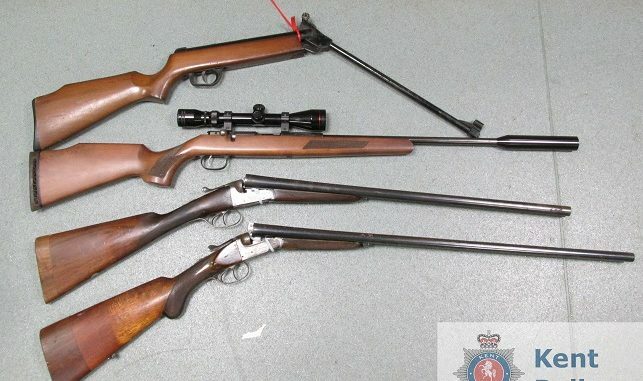 Detective Chief Inspector Patrick Holmes said: “We are carrying out this two-week firearm surrender to encourage the public to hand in as many unwanted or unlicensed firearms as possible. “The surrender is part of Kent Police’s ongoing work to tackle, disrupt and prevent violent crime across the county. Please check the opening times of a station by visiting the Kent Police website before attending. People wishing to dispose of an unwanted firearms or ammunition who cannot attend the above stations should call 101 and collection will be arranged. Why not add Knives to the Amnesty?